I remember renting—yes renting—a Playstation from Blockbuster to play Gex: Enter the Gecko back in 1998. I rented it along with Final Fantasy VII, but fell in love with the wise-cracking reptile and spent most of my rental time with him... Ever run into an old friend and wonder how the hell you got along? 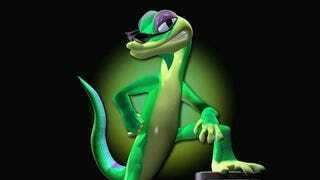 Gex: Enter the Gecko was developed by Crystal Dynamics and released by Midway back in early 1998. So, let's prepare our minds by going back and taking a look at everything that just happened in 1997. Now we're in the right mindset! Let's continue. A few weeks ago I ran into Gex again in the Playstation Store where he sat for sale at the measly price of 99 cents. There he was, staring at me like, "Come on, pal... remember the good ol' days?'' I thought, what the hell, Enter the Gecko was hilarious when I was a kid. So I ponied up and Gex and I were together once again. ...Oh god, what have I done? Without trying to be nit-picking (and inevitably doing just that), the overall control of Gex is loose, baby. Really loose. Funnily enough, unlike Croc, controlling Gex is like handling a slippery little lizard. And while that should be all the more appropriate for this game, players shouldn't feel frustrated with it, and even after adjusting to the feel, I found that this particular aspect of the game could've used more work and fine-tuning. Visually, the game is half genius and half fart. It's older so it's not entirely fair to judge it... but man, Gex did not hold up well at all. When I think of other platformers from around the same time, like Mario 64, I can't help but wonder if people thought this game looked good then? The charm in Mario 64's design allows it to be timeless in a way. Gex doesn't really give off the same... glow. Let's just say that Gex put on a few extra pounds in the last 16 years. The experience of exploring Enter the Gecko's world is somewhere between Banjo Kazooie's silliness and Conker's Bad Fur Day's sense of humor. This game killed me when it came out, but most of the jokes are pop culture references and they've reached their expiration date. But hey, if you still find references to Austin Powers funny, you're all set. "My inner-child is coming out... and it hurts." "Uh, hi... I'm here for the Real World interview?" "Here at the Shannon Doherty Charm School it's business as usual." - referring to a horror movie level. "Reminds me of Jackie Chan's bathroom." - referring to an over the top kung fu level. "All this technology so fat guys can hear Rush Limbaugh?" The voice and pen behind the jokes is comedian and writer Dana Gould, and I must admit I still chuckled at a couple. Honestly, it's probably more fun to start a level and just sit there while Gex riffs. It get's old fast, though. Somewhere between the levels Gilligex Isle and WWW.DOTCOM.COM I was already looking for reasons to stop playing, "Don't I have to clean the oven? Or something... There has to be something I should be doing!" It looks like a scrapped Nickelodeon cartoon that got one pilot and was turned into a video game over the weekend by a contracted solo developer desperately looking for his first gig. And fart. It sounds like Matthew Perry—or any other 90s "funny guy"—was given a synthesizer to play and told to do topical one-liners after he was handed a joint. It feels like it's wet... but it's not. Woah. So you reach back out to touch it again and it's soft, like shag carpet. It's not great, it's not what you expected, but you don't completely hate it. It tastes like some sugary, "fruit flavored" cereal that you just poured a huge bowl of because your parents aren't up for another hour. You're stoked about it. You pour the milk and scarf it down while you watch cartoons... but afterward you have a gnarly stomach ache and you regret it completely. It smells like stale Cheetos and that weird smell when you were a kid and you would stay the night at a friend's house. Are they cooking something? You had pizza for dinner, but it smells nothing like Pizza.